Now through Week 5 of the 2018 NFL season, we’ve gone to the grades to rank all 32 starting quarterbacks in the NFL. Given that you’ve likely already scrolled past this, let’s just dive in! 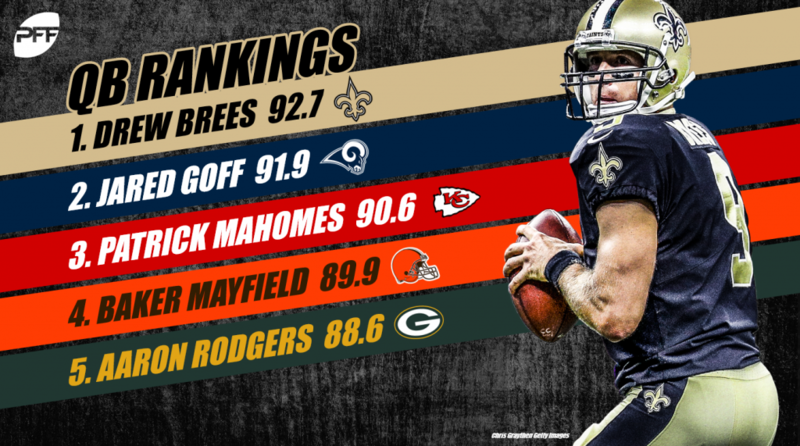 Your MVP front-runner after five games, Brees has posted a superb 92.7 grade that would be his highest since 2011 should he maintain that level of play over the rest of the season. Pinpoint accuracy has long been the hallmark of the NFL’s new all-time passing leader, and that’s been no different this year. After finishing as the league’s most accurate passer by our ball location charting in 2017, Brees once again has the highest percentage of accurate throws in 2018. After taking a significant step forward in 2017 following a rough rookie campaign, Goff has raised his game to a new level in Year 2 with Sean McVay. While the former Cal standout undeniably benefits from McVay’s offensive genius (Goff has the second-highest percentage of open throws so far), Goff has more than held his own when asked to make difficult throws. Goff’s 13 big-time throws are tied for third-most, and he’s been our highest-graded passer when throwing into tight coverage. The question entering Mahomes’ first season as a starter was whether he would be able to avoid the poor decisions that sometimes plagued him at Texas Tech, where he ranked second in turnover-worthy plays during his final college season. So far the answer has been a resounding yes, as Mahomes has just three turnover-worthy plays in 191 dropbacks. The special throws downfield have been there too, as Mahomes leads all quarterbacks with 472 yards on deep passes. Mayfield was the best college quarterback we’ve seen since we began grading the FBS in 2014, and he’s lived up to the hype early on. The box score fails to capture how well the rookie quarterback has played through two-plus games. The No. 1 overall pick ranks tied for 26th in passer rating and 30th in completion percentage, but that’s largely driven by a league-high 10.3% drop rate and a pair of unlucky interceptions during his first career start in Oakland. When Aaron Rodgers is on the field, Aaron Rodgers continues to do good football things. He’s throwing the ball downfield more frequently than he did a season ago, and he’s been very effective when doing so. Rodgers owns a top-five grade when throwing to both the intermediate and deep levels, and he’s done so while continuing to be one of the league’s best at taking care of the ball with just two turnover-worthy plays. Consistently a middle-of-the-pack quarterback, Dalton is off to his best start through five games since 2015, when he ultimately finished as our seventh-highest graded passer. 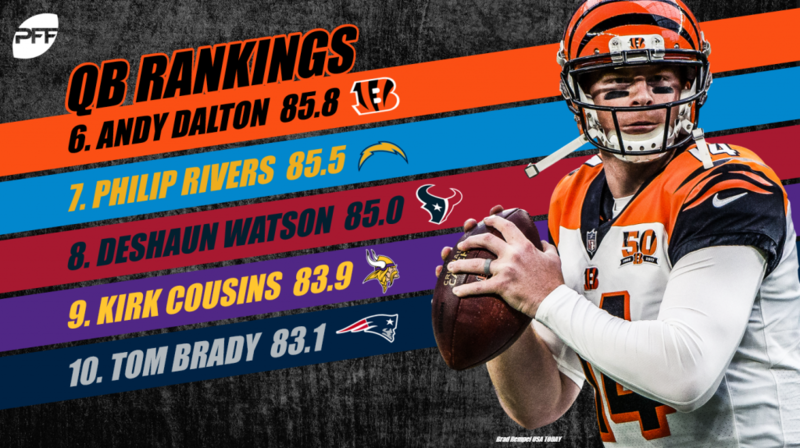 Dalton’s hot start is fueled by a 90.9 grade from a clean pocket (fifth), where he has an eight-to-one big-time throw to turnover-worthy play ratio. After seeing his grade decline for three straight seasons from 2014 to 2016, Rivers is back on an upward trend. Accuracy continues to be a strength for the 15-year vet, as Rivers has been the most accurate passer when targeting receivers with at least a step of separation and the third-most accurate overall. Rivers is also the top-graded passer when using play action at 95.0. Watson’s passer rating has fallen from 103.0 a season ago (would’ve ranked third with enough snaps to qualify) to 94.6 this year (15th), but he’s actually playing better in 2018 on a throw-by-throw basis, as evidenced by a significant improvement from his 68.1 grade in 2017. He’s doing a better job taking care of the football this season and has shown significant improvement in the short and intermediate game. When targeting receivers beyond the line of scrimmage but less than 20 yards downfield last season, Watson had a 60.2 grade that was tied for fourth-worst. This year, that’s all the way up to 90.2, good for fourth-best. Cousins is throwing the ball shorter than he has at any other point of his career, with a 7.1-yard average depth of target that is the third-shortest after five weeks. When he has looked downfield, however, he’s been remarkably effective, earning a league-high 98.1 grade on 20-yard-plus throws with seven of his 12 completions finding their way into the end zone. Given that’s he’s been our highest-graded quarterback in each of the past two seasons, it’s a bit weird seeing Brady this far down the list. The main reason driving Brady’s sub-90.0 grade after five games is surprisingly his play from a clean pocket. Going back to 2006, Brady has never finished with a grade lower than 87.2 when kept clean — this year that’s all the way down to 77.7, and his three turnover-worthy plays from a clean pocket are already half of last year’s total. Luck has been excellent from a clean pocket so far this season, with a 90.1 grade that falls right in line with his 2016 season when he was our third-highest graded passer. However, the mistakes and questionable decision-making under pressure that frequently showed up prior to 2016 have made their way back, and Luck’s 10 turnover-worthy plays are currently the league’s most. After finishing with an 84.9 grade before suffering a knee injury a season ago, Wentz has largely picked up where he left off since entering the lineup in Week 3. Sitting back and playing coverage has not worked out well for opposing defenses so far, with Wentz grading at 87.6 when teams opt not to blitz, good for fifth-best. Stafford has settled in firmly as a middle-of-the-pack quarterback, grading between 67.9 and 81.8 in every season of his career after his rookie campaign. Throwing outside the numbers to the left can be some of the toughest throws for a right-handed quarterback to make, but Stafford has been very effective doing just that. His eight big-time throws and 93.4 grade when throwing left both lead the league. Cam’s 78.0 grade is his highest through Week 5 since 2014. His play from a clean pocket has been excellent so far, with a league-best 86.2 adjusted completion percentage and a 90.2 grade (seventh) that would be the best mark of his career should he sustain it, topping his MVP season in 2015. As was the case in each of Prescott’s first two seasons, throwing the ball downfield remains something the Cowboys don’t do enough of. Dak ranks 31st in deep-throw percentage, but he has been very good when cutting it loose downfield, notching the sixth-highest grade on 20-yard-plus throws. 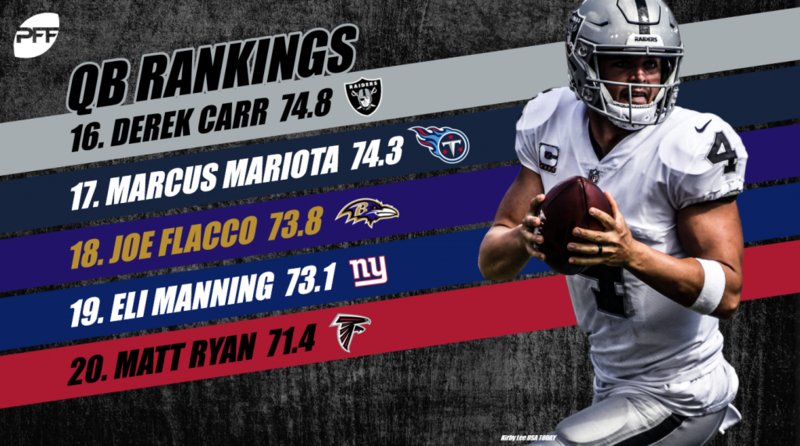 Carr has rebounded a bit from a disappointing 2017 in which he finished No. 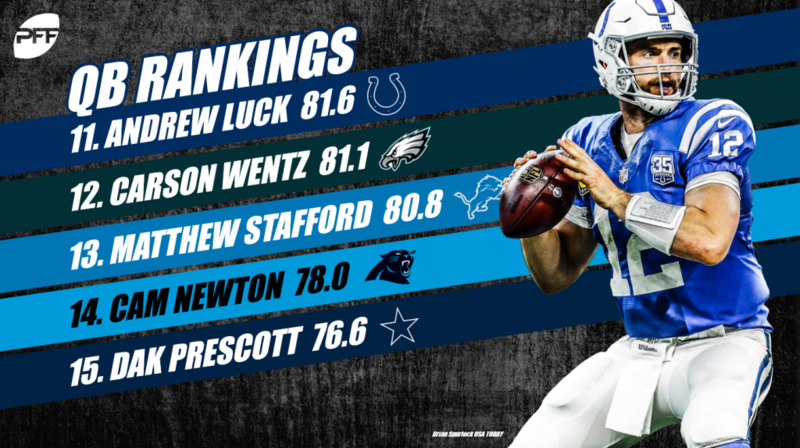 21 in PFF grades, but he is still well below the level we saw in 2016. While he has been the second-most accurate passer so far, he’s been far too conservative with the football, posting the second-lowest average depth of target and the lowest percentage of throws into tight coverage. Last year, Mariota had the rare season in which he was actually better under pressure than he was from a clean pocket. While his under-pressure play has come back to earth a bit, he’s remained very good, ranking No. 3 in passer rating and No. 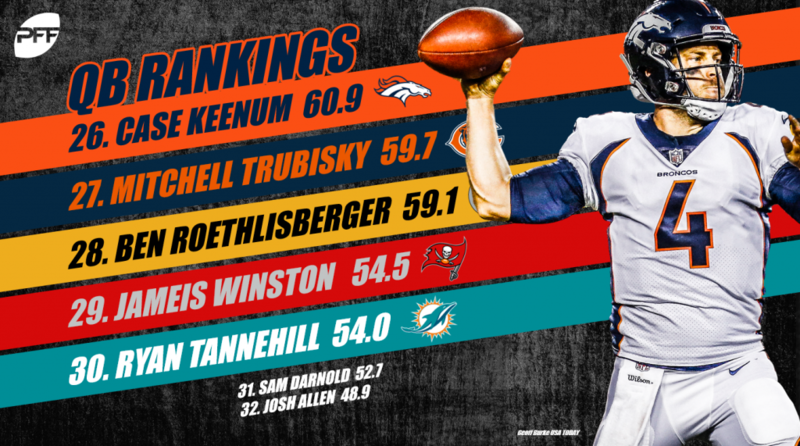 9 in PFF grade when pressured in 2018. Flacco’s grade is up despite a supporting cast that is doing him few favors. His 7.0% drop rate is the fifth-highest, and he’s had the second-lowest percentage of open throws. However, Flacco isn’t completely blameless, as he’s also been the fourth-least accurate quarterback when targeting open receivers. While the Giants spent the offseason trying to improve the cast around him, Manning has too often been unable to take advantage — he is currently the least accurate passer when throwing to open receivers. It seems as though Ryan’s box-score numbers rarely match his grade in recent seasons, and this year is no different. Ryan currently sits at No. 6 in passer rating, but he finds himself with his lowest PFF grade since 2013. He actually had a lower grade after five weeks last season and went on to finish No. 2 in overall grade, so there’s still plenty of time for Ryan to bounce back to the level we’ve become accustomed to him playing at. 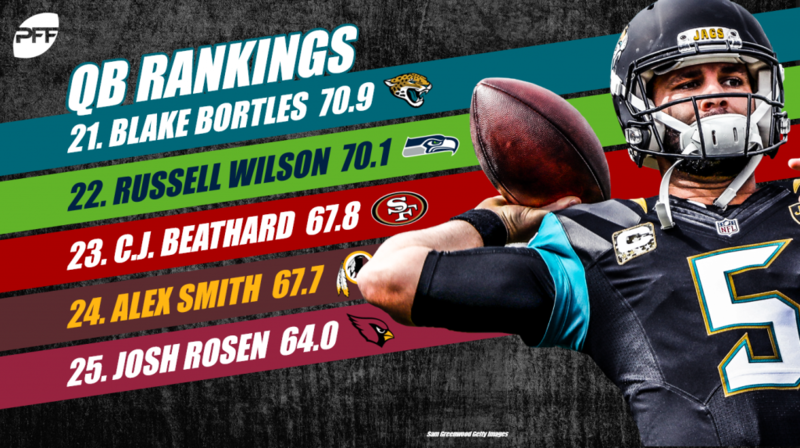 A strong start has fizzled out, as Bortles’ grade over the past three weeks ranks 28th. Defenses have found success by not blitzing and forcing Bortles to throw into coverage, as his 59.1 grade when not blitzed ranks 26th. Wilson has always looked to extend plays and get outside of the pocket, but he hasn’t been as effective in doing so this season compared to others. His 62.1 grade on throws outside of the pocket would be the second-lowest of his career and more than 50% of his yards on such throws are coming after the catch for the first time. Thrown into the fire following a season-ending injury to Jimmy Garoppolo, Beathard has been solid in two games as a starter with a 67.8 grade that improves on the 59.5 grade he earned in 2017 as a rookie. However, there’s no question the 49ers’ offense has been limited with him at the helm. Beathard has the lowest average time to throw (2.30 seconds), is targeting receivers more than a full yard closer to the line of scrimmage than any other qualifying passer (6.1 yards) and outside of a long touchdown throw to a wide open George Kittle, the deep passing game has been basically non-existent. Following years and years of conservative play, Smith was the league’s best downfield thrower in 2017, finishing first in both passing yards and adjusted completion percentage on throws 20 yards or more downfield. Unsurprisingly, those numbers have come back down to earth this season, as Smith currently ranks 19th and 14th in those same stats, respectively. *Player does not meet the minimum snap qualification but was included because he is now starting. It’s been a roller coaster two-plus games for Arizona’s rookie quarterback. After struggling in relief during his first official NFL action against the Bears, Rosen bounced back with an excellent performance against the Seahawks (87.1 game grade) only to fall flat against a poor 49ers defense in San Francisco last week. Rosen has been pressured on an incredible 47.7% of dropbacks so far, the highest rate in the league. Unfortunately for Rosen, that’s unlikely to improve considering the state of Arizona’s offensive line. It was always going to be tough for Keenum to duplicate 2017’s success in less favorable conditions than what surrounded him in Minnesota. Keenum was excellent when it came to avoiding negative plays last season, finishing seventh in avoiding turnover-worthy plays and posting the second-lowest sack rate when pressured. Both of those numbers have seen an increase this season. Keenum’s eight turnover-worthy plays are tied for second-most, and his sack rate when pressured is up to 18.3% from 10.7%. Trubisky’s box-score numbers look much better than his actual play on the field after four games. He currently ranks No. 8 in passer rating, but he was actually our second-lowest graded quarterback after three weeks before rebounding with a strong performance against Tampa Bay in Week 4. Trubisky has the league’s lowest grade when targeting outside wide receivers, but it improves significantly when targeting all other positions (inline, in the slot, or out of the backfield), ranking seventh. Big Ben is off to his worst start since 2006. He’s among a quartet of quarterbacks with eight turnover-worthy plays on the season, trailing only Andrew Luck. And it hasn’t been just the big mistakes either, but also just too many routine misses as Roethlisberger has the third-highest percentage of both negatively graded throws and inaccurate passes. With the Bucs on a bye in Week 5, Winston’s only action this season has been 23 dropbacks in relief of Ryan Fitzpatrick two weeks ago in Chicago. He’ll make his first start of the year this week against the Falcons. While Tannehill has been solid from a clean pocket, he’s been a complete mess under pressure with a league-low 24.9 grade. This was on full display last week in Cincinnati, when Tannehill had multiple turnover-worthy plays under pressure in the fourth quarter that would fuel an eventual comeback win for the Bengals. Poor decisions were a problem at times for Darnold at USC, and that’s certainly been true during his rookie campaign. Darnold’s eight turnover-worthy plays are tied for second-most, and he has the highest percentage of negatively graded throws. We’ve seen glimpses of the big-play ability he showed in college, but those plays have been too few so far. It hasn’t been a pretty start for the much-maligned rookie quarterback. Accuracy was a problem for the Wyoming product in college and that’s been true in Buffalo as well, as Allen is the second-least accurate quarterback so far. He’s also been unable to capitalize on his big arm with throws downfield, owning the lowest grade on throws 20 yards or more downfield.